PATH FINDERs' historical & cultural learning environment is established in training areas, and content within the context of Native American experiences past & present. In ARAPAHOE CAMP we use visual aids with task explanation and demonstration to present a skill or topic area. We use a by-the-numbers instructional approach, demonstrating and assisting with hands-on instruction in common/critical skills. Participants get performance evaluations & feedback. Teams begin the BEARS' DEN activities with an explanation of the PATH FINDER Drill Play Adventure. Team leader/Instructors then coordinate Teams in the Drill Play, evaluating Team Work. Our Team Leader Triad guides teams along CHEROKEE RUN toward their objective with, or without, rally/check points. Teams should encounter/traverse diverse terrain along their way. The course route may include confidence challenges, such as rope bridges or difficult terrain. Teams encounter simulated casualties at WOUNDED KNEE HILL and demonstrate skills for emergency treatment. Teams then "RECOVER" the simulated casualty to a safe delivery point. 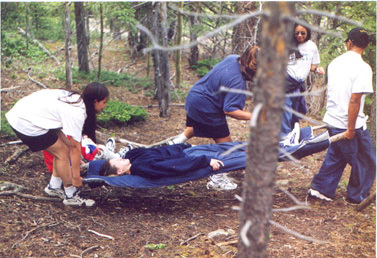 Teams transport their simulated casualty along CHIEF JOSEPH RUN to a safe delivery point using a field litter on a course with, or without, rally/check points. Teams may encounter/traverse diverse terrain along their way. This course may include confidence challenges such as, wall/water crossings, tunnels, under crawls or difficult terrain. The EAGLES' NEST is the safe delivery point, (field first aid station), where teams deliver their simulated casualty along with a report of their condition and status. Orienteering instruction on the use of the compass in the field occurs on PATH FINDERs' Arrowhead shaped Day Course, Cheyenne Trail and Night Course, Lakota Trail.